I am thinking about getting out of ATV and into Side x Side. I have an Arctic Cat TRV700 for my young son and I, but I'm looking for something exciting for the spring! I enjoy my dealer, heck of lad, good service, good character, but he does not have any 2016 or 2015 side x sides and all dealers around the country are seemingly not wanting to release their old stock to other dealers. 2017's no issue. I had my heart set on a Wildcat Sport Limited as I am a pretty broad shoulder and fella with long legs. Now I know you and AJ are slim Jims but Luke looks like he can take down a wild bore at 80 miles an hour and so my question is, I can source a 2017 Trail limited but I am not sure if I will be dissatisfied with settling for smaller unit. 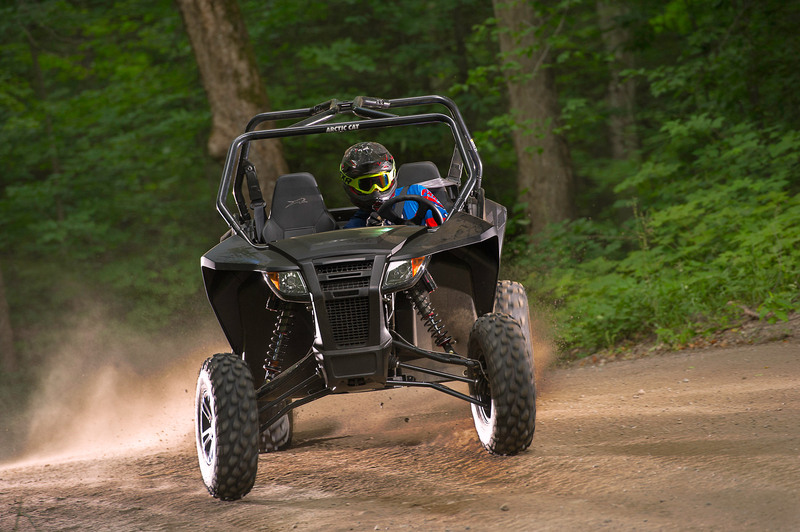 The extra width is something good but the trails do not come with the wider A arms and the fancy shock package and it seems the RZR is not giving as good of spring rebates so I don't think I can reach on a RZR S900 cost. Now to the question, sorry lads, would you be happy with a Trail or would you go for a Sport and would you go as far as Guelph or Montreal to buy one from a dealer you don't know in order to get the 2016 left or would you even settle to get a 2015 trail which is what they are discounting the most, alas to forget about the Sport which is what I really want... Hmm, your tutelage please and thanks. Thanks for the message and for trusting us with this important piece of advice. I'll give you my thoughts in a bit of a point form format to keep things as clear as possible. - All Trail and Sport models have the same driver cabin so the Trail isn't any smaller inside than the Sport. The only difference between these 2 vehicles, as you pointed out, is the A-arms and the shocks. If you fit in one you'll fit in the other just fine and I can tell you, I fit, along side a fully grown camera man, just fine in a Wildcat Sport or Trail. - The extra width of the sport IS definitely a huge bonus and adds to the stability of the vehicle. If it were me buying one, id be buying a sport. The only time id look at a 50 inch wide sport SXS would be if I had a specific reason or need for the 50 inch width. Sounds to me like you dont NEED this SXS to be 50 inches wide so my suggestion is to find a Sport if you can. The upgraded shocks are worth it on their own. But the width is going to make the whole vehicle more fun on the trails. - I applaud you for wanting to stick to your local dealer with whom you've developed a good relationship. That's such a HUGE part of the ownership experience, you're doing the right thing. However, if he can't get you the model your looking for, perhaps it would be worth talking to him about it and letting him know that your loyalties are with his dealership (or hers... no discrimination) and no matter where you buy your vehicle from you'll be bringing it to his dealership for service and to purchase accessories, but that you may have to buy elsewhere to get what you want. I would think a good dealer would understand this completely and see the bigger, long term picture. Showing up with a new SXS you didn't buy from him could ruffle some feathers, so talk to him first. -You seem like the kind of guy who wants to hold onto a SXS for a while before upgrading again. So, if you have to drive a decent distance to get the exact vehicle your looking for, do it. One long day of driving will be well worth 4 or 5 years worth of enjoyment from the vehicle you want. But saving a day in the car and getting a vehicle that wasn't EXACTLY what you want... that's not worth 4 or 5 years of buyer's remorse. I ride motorcycles and have done this MANY times. Drive up to 4 or 5 hours to get what I wanted and once I had it home, the drive seemed trivial because I was so happy with my new bike. - Lastly, the price. As I understand it, you can get both a 2016 Trail limited and sport limited for a good deal but the best deal is on a 2015 trail? If so, and this goes back to my last point, get the sport. If it costs a bit more, divide the difference over the # of years you plan to keep it. I think you'll find that it wont add up to more than a few hundred a year... or maybe $20 a month max. Then ask yourself, would I be happy to spend an extra $20 every month I ride this vehicle to have the exact one I want. Or would I be happier knowing I have an extra $20 in my jeans each month? If you'd be happy to spend the extra and get what you want... do it. If you'd be happier to save the extra, don't. IMO, buying big boy toys like these is all a matter of balancing what you won't regret spending with what you won't regret buying. There's nothing worse than coming home with a shiny new vehicle only to regret paying for it every month and there's also nothing worse (they are equal) to coming home with a vehicle you compromised on only to wish you had something different. I'm confident you'll find that perfect middle ground. Hope that helped and thanks for watching. Is The 700 MudPro Worth The Investment?